James Dietz Handsigned and Numbered Limited Edition Print:"Fighting Fearlessly"
Edition: Artist Signed and Numbered, 250 Publisher Proof Edition, 100 Artist Proof Edition. About the Art: Task Force Dragons answers the call during their first contact in support of Operation Enduring Freedom 12-13. Task Force 4/1 found itself operating through the mountainous and valley strewn provinces of Paktika and Ghazni, Afghanistan. Their area of operation encompassed approximately the size of the state of West Virginia with a 400-mile border with Pakistan and has over 27 districts. The Task Force conducted focused security force assistance, neutralized the insurgent strongholds, and assured the freedom of movement along essential economic corridors in partnership with joint, combined and multinational allies and partners to secure the populace and transition security primacy to the Afghanistan National Security Forces. "Fighting Fearlessly" is the indomitable spirit of each Dragon Soldier, who fights alongside the Afghanistan National Security Forces conducting partnered operations for the greater good of the Afghan population. 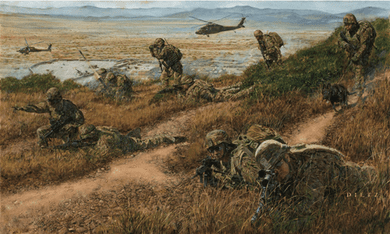 The portrait depicts infantry and cavalry squad-level tactics against Taliban insurgents at Combat Outpost Margah and highlights the diversity of skills associated within the Task Force. Every member of the Dragon Team was essential to the overall mission success resulting in Afghanistan partners who are now able to shoot, move and communicate, with confidence against insurgents in their battle space, securing the trust, support and love of the people they have sworn to protect. From 16 June 2012 to 15 February 2013, Task Force 4/1 was involved in more than 800 engagements with the enemy, and fired more than 5800 artillery and mortars rounds. 273 Dragon Soldiers were wounded in action and nine made the ultimate sacrifice throughout this complex, counter-insurgency fight. As Operation Enduring Freedom, Afghanistan comes to an end; the Dragon Brigade's actions ensured that they will forever be etched in the history of modern warfare. The Soldiers of Task Force Dragon were focused on improving governance in close partnership with the provincial and district government leaders, and advising and assisting in refining the techniques, tactics and procedures of the Afghanistan National Security Force through the ever evolving conflict. The overall efforts of each war fighter has helped contribute to the successful accomplishment of legitimizing the Government of the Islamic Republic of Afghanistan and restoring the confidence in the ANSF efforts of protecting, stabilizing and securing a brighter future for the people of Afghanistan.